Random House Books for Young Readers, 9780385390804, 40pp. PENNY PARKER KLOSTERMANN loves trout fishing, digging for earthworms, and her sisters! This is her first picture book. BEN MANTLE has most recently been working as a children’s book illustrator from his shared studio in Brighton, England. He also produces screen prints and digital artwork for exhibition. Ben Mantle has illustrated numerous picture books, including the popular board book Five Little Pumpkins. 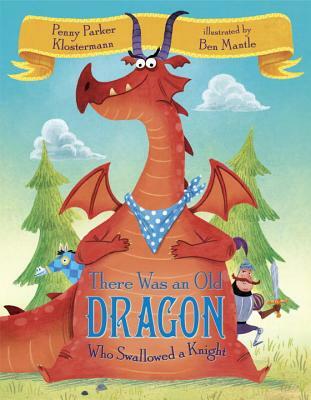 "No one seems to know why the old dragon swallowed the knight (“It’s not polite!”) In addition, the bright red beast proceeds to swallow a steed, a squire, a cook, a lady, a castle, and finally, a moat. At this point the creature decides to burp out everything (except the knight), and what preschooler won’t love that! The author has used a broad range of words—savory, shady, fattens, tassel, guzzled, bloat, quote, perchance, amass, and billow. These will add depth to the young listener’s vocabulary. Mantle’s illustrations are full of primary colors and are quite expressive as the dragon gobbles each entity he encounters. Life in the Middle Ages is hinted at with the additional drawings surrounding each dragon tidbit. This will be a great addition to the kindergarten/first grade curriculum on comparing and contrasting similar stories. VERDICT A fine purchase for most collections."